So here goes the story. I was given this crazy purse by my brother 2 years ago for Christmas and I still haven't figured out how, when or where I could wear it. I can honestly admit that I'm not a huge fan of Uggs and I haven't got a faintest idea as to how on Earth one can make a tiny furry golden purse wearable. I mean, I like how different and quirky this is (that's precisely why my brother got it for me in NYC), so I'd love to make it work, but how? Ladies, I'm begging for your tips! Actually, there's more to my brother's gifts. Last summer I was given this top, found in some vintage store in Williamsburg I assume, together with a matching shopping bag. No, scrap that, there's Jesus on the bag, and my bro searched the States high and low to finally find in New Orleans. He said it was a witty postmodern reinterpretation of the myth, or something among those lines. However, no matter how long I look at it or how vehemently I'm trying to convince myself I'm being tolerant, it seems more like a... blasphemy to me. 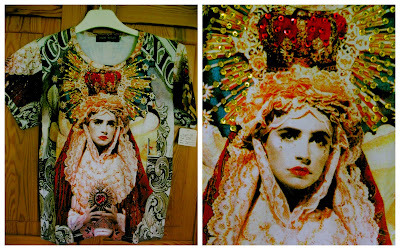 Besides, I'm living in a 98% Catholic society, I'm pretty sure wearing this would be simply suicidal. Certainly Poles don't envision Virgin Mary wearing seductive red lipstick and sequinned crown. 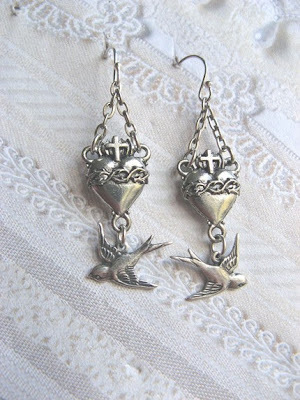 Still, I would have no problem wearing these Sacred Heart earrrings I found at this Etsy store. What is it then? Is it a matter of scale, obviousness, choice of particular religious symbol? Probably all of the above. What's your take on this? Do you ever wear religious symbols? Would it be ok for you to sport the top my brother gave me? Hey! Would honestly say neither of those two are my cup of tea and I think one need to have a very strong sense of very unique style to pull them off. The t would probably work with jeans and leather jacket or blazer, but... If YOU don't feel comfortable about wearing them, no matter how many opinions you will get, it's not going to change the way you feel inside yourself about those things. So... If it's not you, don't force yourself just to be nice... that's not going to make you happy.